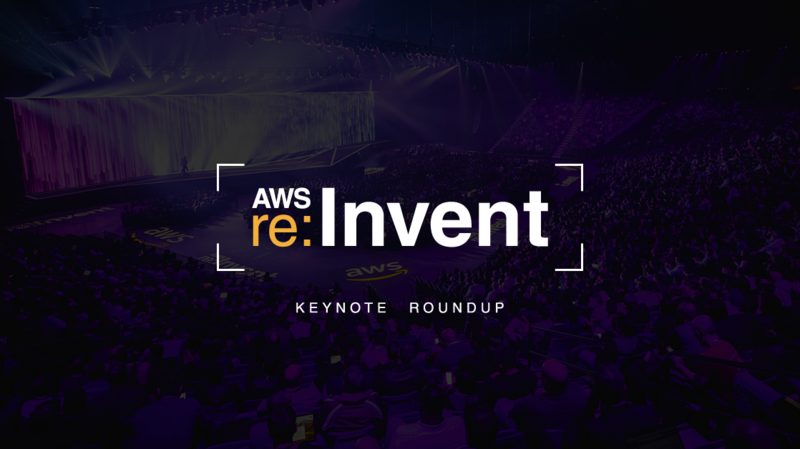 AWS re:Invent 2017 went down last month in Las Vegas. We watched the conference keynotes with great expectations for service announcements, but the big question on our mind was: How are they going to top last year’s spectacle of driving a semi-truck onto the stage? Our betting pool was split between landing an Apache helicopter and an X-Wing. For the first big keynote, AWS CEO Andy Jassy took the stage. He started by emphasizing how awesome AWS is: Monster customer growth, a top spot in the Gartner magic quadrant, and the massive variety of available services. In short, AWS rocks the most-complete technology platform to be found anywhere. They offer an unmatched number of available services. Even though they own the market, their engineers still churn out new ones continuously. Clearly, AWS intends on keeping that top spot, and Jassy emphasized how much they listen to customers and build services around how developers want to use the platform. Let’s jump into a couple of the noteworthy announcements. A number of developers utilize containers in their app infrastructure. The self-contained, easy-to-deploy, easy-to-update, and tear-down app infrastructure has drastically changed web app development in recent years. Millions of containers are fired up each week within Amazon’s ECS service, which represents a 400+% growth since last year. As great as containers are, though, they still require you to build, maintain, and monitor an underlying infrastructure of servers to run the show. AWS has done away with this burden with the unveiling of AWS Fargate. Fargate is serverless container management, which equals much less heavy lifting for devs. No servers or clusters to worry about, scale your apps at a click and get back the time you need to build your app. The RDS service is a big deal at AWS, it’s their fastest growing service ever in fact. Jassy made a great sell for using their open engine databases versus servers running expensive commercial products. You get same or better performance and availability but at a tenth of the price. Whether it’s open source favorites PostgreSQL or MySQL, or Amazon’s own DynamoDB or Aurora, not only are you already covered, but AWS continue to improve on these offerings. The biggest update to RDS was with Aurora Serverless. When deploying an Aurora database, you have to specify the instance type, good for predictable IO loads. With serverless, the databases processing power scales automatically and transparently to match the workloads. Even with no loads, the processing is scaled down to zero, saving you from paying for idle power. Warm resources are always on standby though, ready to start answering requests immediately. Machine learning is increasingly taking over tech. The field deals with training computers to take data and learn from it without human intervention. The results can be applied in many areas: Playlist suggestions on Spotify, real-time stock trading, or beating human competitors at chess or Super Smash Bros.
Getting started with machine learning is complicated, and AWS wanted to empower everyday devs to tap into it without requiring a Ph.D. Enter Amazon SageMaker, an end-to-end ML solution. It takes over the heavy lifting, providing the necessary infrastructure and algorithms to help build and train your models quickly, and let you get on with developing. Vogels wanted more so to cast a vision and revisit how developers are reinventing and reimagining developing their apps. While he touched on many high-level areas of development, architecture, and security, one big point he hammered home was the rise of voice control. Machine-centric interfaces have always been that, machine-based. You use a keyboard or mouse to type predefined commands or click buttons. While a good UI should be intuitive, Vogels describes a voice-driven interface that he calls human-centric. His example was the Amazon Alexa devices. These boxes aren’t smart, they just need to get online and send your voice queries to the cloud. Once in AWS, your speech is converted to text, and machine learning processes the input which triggers a certain skill (get the weather report or place an Amazon order). The skill outputs a text response, which is converted to speech and sent back to your device. Vogels sees this as the future of applications, both at home and in the office — with natural voice control disrupting how we have always interfaced with computers. A lot more was covered in this keynote, and while neither an Apache nor an X-Wing graced the stage, there was a sweet staged UFC fight, demonstrating the combined power of IoT sensors, machine learning, and real-time analytics. We’re not going to lie, they made Spiceworld seem pretty mild. If you’re listening Spiceheads, get us that X-Wing next year! AWS is clearly the market leader, both dominating the cloud market and constantly innovating and delivering services to make app development. If you want to get started CBT Nuggets has the training you need to start becoming an AWS pro.